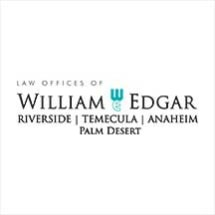 At the Law Offices of H. William Edgar in Riverside, California, we focus our practice exclusively on family law in order to provide the highest level of representation and support for the serious and complex legal challenges affecting your family and your family's future. Established in 2004, our law firm has grown to include four offices throughout Southern California, and we have become one of the region's leading legal practices for those going through divorce as well as those dealing with other family law matters such as domestic violence, child protective services issues, guardianships, paternity and more. As further evidence of our success, our firm's attorneys have earned Superb ratings on Avvo as well as designation from the American Society of Legal Advocates as being among the Top 100 Family Lawyers in the country. We understand the stress and anxiety you are likely feeling regarding your situation, and we promise to treat you with the same care and respect we would provide to a member of our own family. Dedicated to helping you resolve your conflicts and reach agreements as amicably and efficiently as possible, we can help you negotiate favorable terms through alternative dispute resolution techniques instead of having to resort to timely, expensive and contentious court battles. However, we are also tenacious trial attorneys who will not hesitate to advocate on your behalf in court if necessary, and we are fully committed to helping you secure the positive results you seek and be there for you throughout all legal proceedings. To find out more about how the Law Offices of H. William Edgar can best serve your needs, you can call us or visit our law firm's website to schedule a free initial consultation.